A family-run restaurant for over thirty years, Almazett in North Caulfield offers delicious Lebanese food at competitive prices. The food served is quite traditional, and they encourage tables to order a selection of dishes to share rather than each person ordering their own meal. The popular banquet, or 'mezza' as it's known in Lebanese, allows for a taste of everything. For only $42 per head, you can continue ordering dishes until you are satisfied. They start you off with a selection of dips, such a Baba Ghanooj and Tahina, with warm pita bread - but tempting as it may be to fill up, make sure to save some room for the delights to follow. Meat is introduced in the entrée selection, with a variety of chicken, lamb and beef dishes available. There are also plenty of bean-based options. Make sure to order the delicious 'fatayer bi jibneh', which are pastries filled with fetta and herbs. For mains, there is a selection of fish dishes and grilled meat; all of which are quite oversized and could easily feed more than one person. While most of the food contains meat, particularly lamb, there are some vegetarian dishes on offer such as felafel, traditional salads, and various cabbage-based dishes. Middle Eastern sweets are a specialty at Almazett, with their halaweh and Turkish delights being popular choices. Although the restaurant is beautifully decorated with tapestries and arched doorways, the atmosphere is quite relaxed and cosy. The staff are attentive, friendly, and happy to offer advice on what to order. 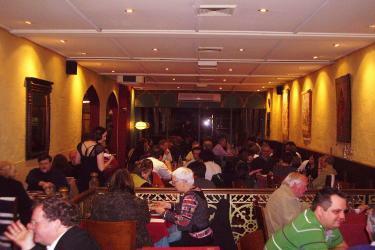 On Friday and Saturday nights, their busiest times, patrons are delighted by a belly dancing performance. A belly dancing performance at Almazett. Although walk-ins are welcome, booking in advance is advisable as it can get quite packed. Why? For a delicious cultural experience. When: 7 Days, 6:00pm until late. Cost: $9 entrees, $24 - $32 mains.